the air coming through the windows this morning felt cool. almost chilly. it has been a long while since the last time i could say that of a morning here. we have had a very hot, very humid summer…not my favorite combination. but today. it was different. and it made me feel immediately homesick. that happens every fall for me. maybe it’s a melancholy recognition of the passing of time, years zooming by. maybe it’s the season-change-thing…we know grey days are lurking right around the corner. either way, i feel homesick. it’s a time when i miss long island the most, recall my growing-up years, pine for the autumn at millneck manor and long deserted-beach walks at crab meadow. a time when my sweet momma and poppo are really present for me in their absence, if that makes sense. i yearn to talk to them. a time when The Girl and The Boy seem oh-so-grown-up now, steeped in their own adult-lives, having adventures and being a dynamic part of this world, far away, without the benefit of hearing ‘good night moon’ every night. i know that every evening they roll their eyes at my goodnight texts to them, but i figure that someday they will understand. homesick. yesterday was my father-in-law’s 85th birthday. we called columbus and sang ‘happy birthday’ to him. my momma and daddy did that every year for me and i try to carry on the tradition with the people i love. he laughed and told us he had gotten back from dinner at texas roadhouse and was listening to an old record. he listens to old records a lot. i suspect, because he is the man he is, that he gets homesick. i can tell by his eyes that he would totally understand me if i told him how i felt. so today, if you are spending time together with someone, memorize it. if you are lucky enough to spend time with your momma or your daddy, please hug them. if you are one of the fortunate parents who have their children nearby, hold on just a little tighter and look into their faces when you say goodnight. relish it. Categories: kerri sherwood, ks friday, life, Uncategorized, yamaha | Tags: a daughter's love, autumn, cdbaby: kerri sherwood, children, children's books, columbus, crab meadow beach, daddy, dads, daughter, david robinson, davidrobinsoncreative.com, fall, family, fatherhood, good night moon, goodnight moon, happy birthday, homesick, itunes: kerri sherwood, kerri sherwood, kerri sherwood friday, kerrianddavid.com, kerrianddavid.com/the-melange, kerrisherwood.com, long island, love, memories, millneck manor, moms, motherhood, music, my sweet momma, old records, parenthood, piano, poppo, relationships, relish it, reminiscing, society6.com/kerrisherwood, spending time, spending time together, studio melange, text goodnight, texting, the boy, the girl, the melange, this part of the journey, this part of the journey cd, time, time flies, time together, yamaha, yamaha artist, yamaha pianos, yamaha recording artist | Permalink. my sweet momma’s birthday is today. she would have been 97. she died shortly before her 94th birthday but remains a force in the world. her kindness and her zealous belief in kindness continue to ripple outward. i heard beaky firsthand when My Girl was talking about the world and its issues and said, “the best thing i can do is to be kind to people.” i’ve seen beaky firsthand when My Boy has stood firm in raising pride awareness. now, i know this story has been told before, but i risk being called redundant to tell it again. back when my momma was 93 and facing down stage four breast cancer having had a double mastectomy a few months prior, she told us she felt like she had accomplished little in her life. there could be little farther from the truth. but she insisted she had no title (“engineer”, “architect” etc) to put after her name. we knew she had, however, three manuscripts she had written decades prior – stories about the family dachshund named shayne – stories she had tried to have published with no success back in the day. stories told from shayne’s point of view and simply wholesome and delightful, we searched for – and found – the manuscripts. and immediately got to work. my amazing husband david illustrated the first of the trilogy, named SHAYNE. i laid out the text and the graphics of the book itself, designed merchandise like an “author” shirt, banners and a shayne iphone case for momma, built a website, contacted newspapers and we hastened to put together a release party with a reading and press and a celebration with brownies and asti spumanti at her assisted living facility in florida. when we told her – on MY birthday in march (for what could be a better thank-you-for-my-birthday than this?) what was happening on april 11th, she squealed like a school girl and started practicing signing her name with a sharpie. it was BY FAR one of the pinnacle moments of my life to see my mom – the AUTHOR- hold her book, read aloud to the dozens of people who attended and sign “BEAKY” on her books as her fans lined up to purchase the earliest copies. eighteen days later, my sweet momma was no longer on this earth. david has since illustrated both the second and third books. the second, SHAYNE AND THE YELLOW DRAGON, was released a couple years ago and today, on her birthday, i am so excited to tell you that the third SHAYNE AND THE NEW BABY will be released shortly. the trilogy will be complete! my sweet momma, beatrice h. arnson “beaky” the AUTHOR would be pretty jazzed to sign each of these, but i know her blessing is on them as she reaches through the invisible line between heaven and earth. we will keep you posted on the release. i have this sweet vision of so-so-many-many-books being sold (to individuals, to schools, to libraries, to dachshund owners, to families with small children, to families with dogs, to dog lovers, to teachers, to scholastic press or to some entity that sees how important it is to have dreams come true – at ANY age) that we might start a beaky-beaky foundation and help – in some well-thought-out way – in momma’s name. if you have any ideas, let us know. we want to keep beaky’s ripples going. Categories: DR thursday, kerri sherwood, life, momma, Uncategorized | Tags: a force in the world, accomplishment, almost-94, amazon.com, author, beaky, beaky's ripples, beaky-beaky, beaky-beaky foundation, beakysbooks.com, beatrice h. arnson, breast cancer, children's books, dachshunds, daughter, david robinson, david robinson thursday, davidrobinsoncreative.com, DR thursday, dr. jim cox, dreams, dreams come true, family, gift, horizon bay assisted living lutz florida, illustrations, kerrianddavid.com, kerrianddavid.com/the-melange, kindness, life, love, motherhood, my sweet momma, presence, publishing, sharpie, shayne, shayne and the new baby, shayne and the yellow dragon, shayne trilogy, society6.com/davidrobinson, st pete times, stories, story, tampa tribune, the boy, the girl, the melange, wholesome books, writer | Permalink. today is my sweet momma’s birthday. she would be 94 today if she were still on this earth. i suppose she is 94 anyway, only this time i can’t celebrate with her in a traditional way. i know that i have been writing a lot about her these days. i am filled with memories, surprised in a moment by tears, and i can hear her voice in my head. i’ve been so lucky. i had the privilege of her on this good earth for 56 years. but i truly miss her. jen wrote, “that relationship with our mom is so grounding and when it’s gone or changed, life feels so different.” yes. on april 11 the first of momma’s books was released, the first of The Shayne Trilogy. her joy at that reading and signing was a pinnacle moment for us – watching her, at almost-94, surrounded by people, sharing her writing. today, at would-be-94, we announce the release of the second in the trilogy. we thought it would be finished a bit sooner, but we kind of fell off the pony for a bit, so to speak. all of a sudden last week though, we felt infused with energy to get back to work on it. it is one of my greatest honors in life to make these children’s books happen. despite everything amazing she was in this world, i cannot think of something more important than to have given momma something she valued after-the-comma-after-her-name. someday, after a millionzillion of The Shayne Trilogy have sold to children and schools far and wide, i would love to set up a beakybeaky foundation to help other women, later in life, late in life, do exactly this-find what’s after-the-comma-after-their-name, the thing that they have wished for, the thing that they value for themselves and have put off, delayed for reasons that are valid and important and what women do. but for now, i wish i could see her face the first time she held Shayne & The Yellow Dragon, the first time she read through it. 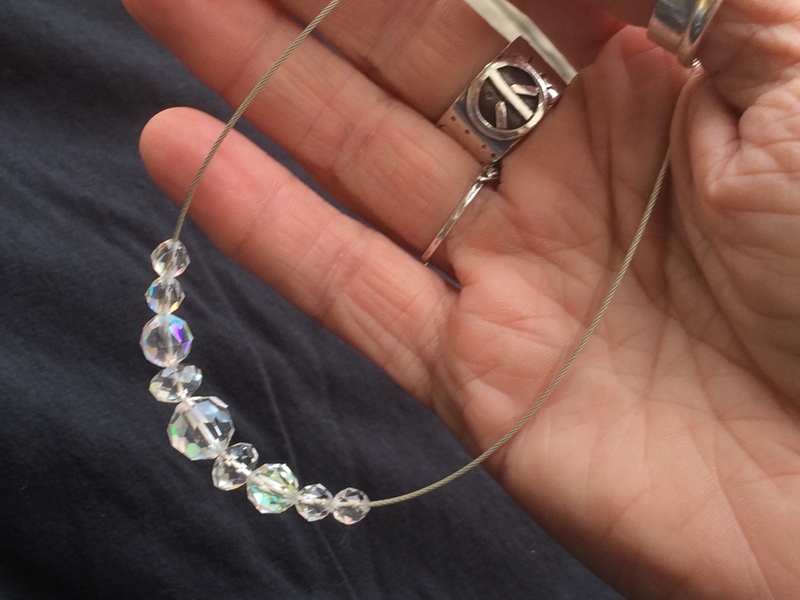 today i am wearing a crystal necklace of hers. when i put it on this morning, i wondered, in my crabmeadowbeach kind of way, if it were too fancy. i decided to wear it regardless of its appropriateness. it’s her birthday and so, it’s perfect. “live life,” she said. i keep remembering that. i can hear her saying it. i know she could see i used one of her favorite big stainless steel bowls for a huge salad for guests yesterday. she could see us slow-dancing on the patio early in the day. she was there at the fabulous fireworks last night, which she adored. she was there this morning when ptom told everyone to “slow down.” my sister said, “i kind of thought that for once mom could actually see me riding my bike today.” yes, my beeg seester. i’m quite sure she was riding along. Categories: kerrisherwood, life, momma, story | Tags: 94, aging parents, beakysbooks, birthday, children's books, crystals, dachshund, life, momma, shayne, shayne trilogy, story | Permalink. sixteen days ago we celebrated with momma the release of her first published book. 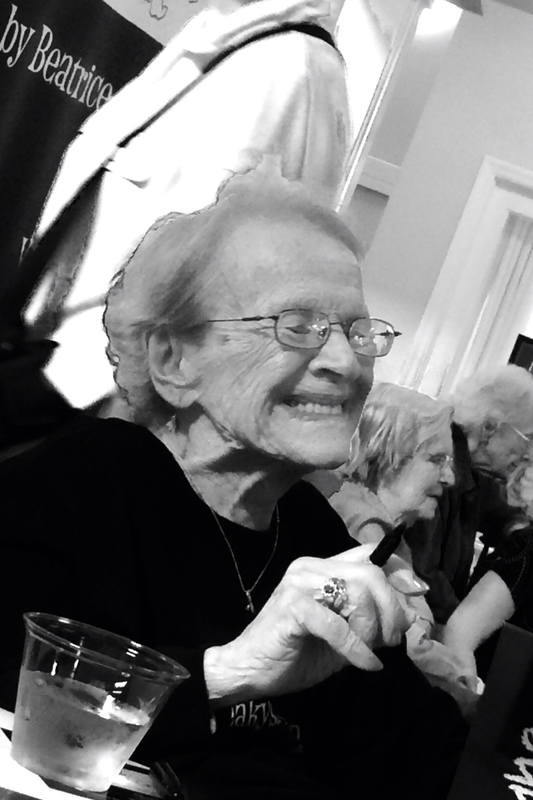 she is beautiful and fiercely independent at almost-94 and she was full of joy as she practiced ahead of time with a sharpie and then signed copies of books for all sorts of people who showed up at the signing of ‘shayne’ – the first in a trilogy of children’s books. at the end of this enormous day, we sipped martini & rossi asti spumante (momma and poppo’s favorite from days gone by) and we ate chocolate-covered strawberries in exultant glee. fourteen days ago my almost-94 momma sent me a text message with her iphone that said she had mastered powering her electric wheelchair all the way downstairs to breakfast and again to dinner. 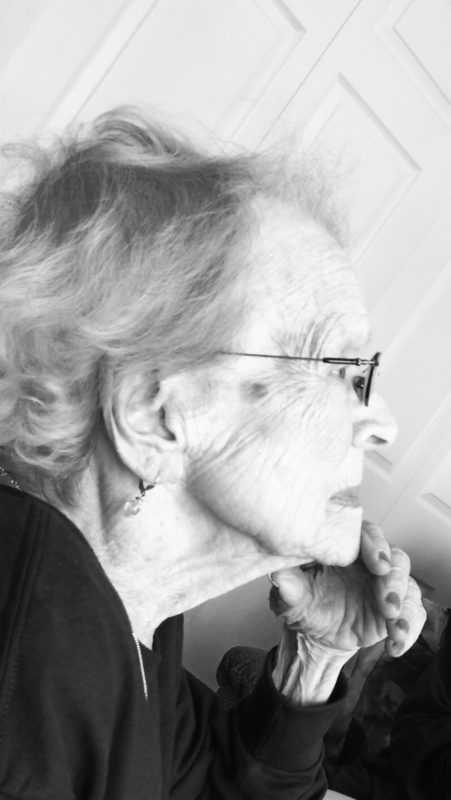 she was amazed she did it and i know she was beautiful and fiercely independent as she made her way through the halls of her assisted living facility. thirteen days ago my almost-94 momma was not having a good morning, but she was elated to see the diary notebook we brought her – we had searched for it and found it in a random bin in her garage. she gently stroked the notebook titled ‘europe 1971’ and i knew she would sit and read all the details, study all the maps, look at all the brochures and hold my dad’s hand and these cherished memories in her mind’s eye for hours and hours. she would envision her beautiful self and my handsome poppo in 1971 and their fierce independence to tour around europe for six weeks in the new vw bug they had purchased there. nine days ago my almost-94 momma called to tell me that kelly had introduced her to new potential residents as “our newly published author” and momma was humbled and oh-so-excited to report this. i am positive she rose up in her wheelchair, beautiful and fiercely independent. four days ago my almost-94 momma was found on the floor of her assisted living facility apartment and was rushed to the hospital. i am quite sure she was beautiful to the caring people who rushed to her aid, but maybe not so fiercely independent. yesterday my almost-94 momma was just conscious enough in her hospital bed to look through my niece’s iphone to see me. tears were coursing down her cheeks and my sister wiped them away. she looked beautiful to me. her fiercely independent spirit is fighting seriously devastating infections. she is in a precarious place. i know she reaches in her mind to my dad in another plane of existence and yet, for now, she clings to this life here. one day ago my almost-25 daughter was briefly in chicago and i had a wonderful opportunity to see her for a precious bit of time. she is beautiful and fiercely independent; she celebrates life on mountaintops and snowboard slopes and on hiking trails. 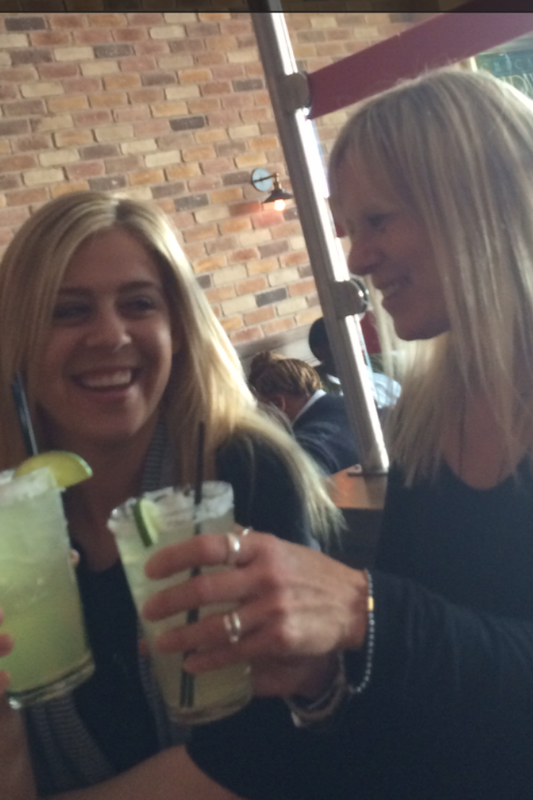 yesterday i celebrated her life with her, a couple margaritas and a gluten-free pizza. life marches on. beauty and fierce independence are passed to the next and the next. and so i hold in this pause my beautiful and fiercely independent momma. i listen for her voice, i hold her in my arms and wait to feel her arms around me. i am awake and present and hyper-sensitive in my vigil with her. i do not know what the outcome of this huge physical trial will be. i try not to have fear. i am holding on and letting go. what i do know? before the pause, in the pause and after the pause i will always love her. her beautiful-ness and fierce independence. my sweet momma. Categories: kerrisherwood, life, momma, sisu | Tags: 94, author, beakysbooks, beautiful, celebrate, children's books, fiercely independent, kerrisherwood, life, mom, momma, pause, shayne, shayne trilogy, sisu | Permalink.